The ‘Tax, Privatisation and the Right to Education: Influencing education financing policy’ is a multi-country project that seeks to ensure that all children have improved access to public education of a high standard financed through greater government support and increases in fair tax revenue. See my previous blog post for further details of the project. In order to reach this goal, the four countries (Kenya, Pakistan, Ghana and Uganda) agreed to collect evidence at local level on the state of financing of public schools, the cost of education per household and the impact of these on the right to education. They also agreed to analyse the education laws and policies regarding the financing of education and the role of private providers, including collecting evidence at the national level to explore the resources that could be made available for education spending if the education share of budget increases, and particularly, if the size of the budget could be increased through decreasing tax incentives given to multinational companies. The national and international advocacy will be based on this evidence. Increasing awareness of people in the community of their right to free and good quality education, and the role of progressive taxation in generating the resources that woud pay for it. Building the capacity of the communities, so they can demand accountability in the delivery of free and good quality education. Building a strong and wide reaching demand for tax justice, which includes earmarked funds for public free and good quality education. Advocating for the creation and enforcement of legislation and policies to improve public education and regulate private schools. 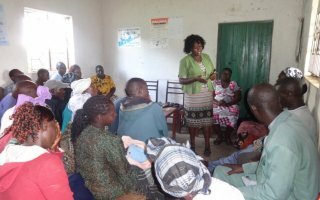 During meetings held at local level to train data collectors and to raise awareness of the right to education, a number of testimonies were shared with community facilitators. Below are two such testimonies which demonstrate the desperation of many parents who are losing faith in public education and are being lured by the promise of better quality education in private schools. States are failing to take their obligations to guarantee the right to education seriously and as a result parents have to make huge sacrifices to avoid the low quality education provided by chronically underfunded public schools. This underfunding is the issue our project aims to resolve. No parents should have to suffer financially for their children to enjoy their right to education. Robert is a parent from a village in the eastern district of Kuria, Kenya. Currently he has children attending a local private school. “My children were not performing well at the local public school because the teachers had many other children to teach and so could not give every child the attention they needed. The school charged us small levies, for example, since there was a deficit of teachers, we were asked to cover the cost of extra local teachers. I felt that for my children to escape the hard life I had, I needed to work hard and pay for them to attend private schools where the teachers can give them individual attention, so they will end up passing their exams and get into university, so they can have better lives,” said Robert. Currently Robert pays ksh 15,000 (£102) in fees per year for his children to attend private school. He believes that more funding is needed to improve infrastructure and teachers’ working conditions in order for parents to regain confidence in the quality of education of public schools. He referred to the recent strikes in public schools where teachers demanded fair wages and better working conditions, in order to improve the quality of education in public schools. Mr Ilyas, a farmer, lives in a village near Karachi, Pakistan. He has seven children, the eldest is eighteen and the youngest is two. His children were enrolled in a nearby government school. However, he was not satisfied with the performance of his children in the school due to a lack of teachers. This made him concerned for the future of his children. 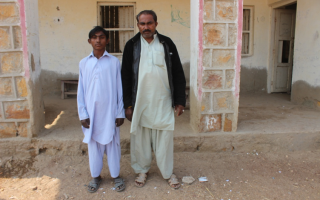 Like many other parents in Pakistan, he made the difficult decision to prioritise one of his children, his ten year old son, Naeem, over his other children in the belief that a private education would provide a better future for him. Naeem attended private school in the city of Makli, Thatta. This cost Mr Ilyas 3000 rupees (£19.8) which included fees, transportation, books, and pocket money. Mr Ilyas earns around 10,000-12,000 rupees per month (£66.1- £79.3) and had very little left to support the rest of his family. Later, like many other parents who have made similar decisions, he realised that he could not afford to send Naeem to private school and had to send him back to the government school. However, Mr Ilyas shared that he has no expectation that the government school could provide Naeem or his other children a future beyond becoming a day labourer like himself. 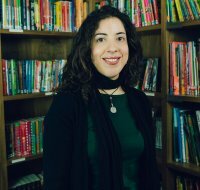 Dr. Maria Ron-Balsera is Research and Advocacy Coordinator for the Right to Education Project.